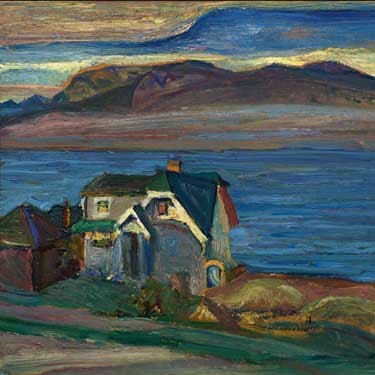 Group of Seven founding member Frederick Horsman Varley, who lived in Vancouver from 1926 to 1936, saw British Columbia as Paradise on Earth. In BC, the Post-Impressionist was inspired to apply colour, composition and Buddhist theory to landscapes and individuals in new, wondrous forms. BC was Varley’s muse; once he left, he never again experienced such exciting and sustained creativity. Varley was a romantic and sensualist who loved the ideal of the freedom found in nature, and the spiritual and physical beauty of women. Though not a devotee of any one religious or philosophical code, a curiosity in mysticism and Asian philosophies evolved from his anxiety toward modern life—he regarded Eastern notions as an antidote to the Western focus on mechanization and moral conservatism. During his time in Vancouver, he believed that objects and individuals emanated an aura and he developed a theory attributing specific psychological means to each colour, casting his paintings around one or two specific hues. An Englishman who emigrated to Canada in 1912, Varley began his career in Toronto as a commercial designer, working with most of his future Group colleagues. 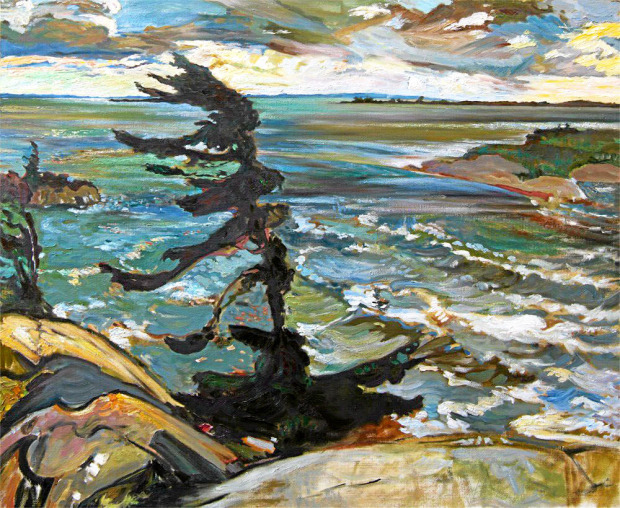 After completing his commission as a war artist, he returned to the Group and, upon its triumph, became known as one of Canada’s leading portrait and landscape artists. But his restless nature, and his desire to escape debtors and crossed friendships, prevailed. He moved to Vancouver in search of a new life and fresh ideas. He became a teacher at the Vancouver School of Decorative and Applied Art (now Emily Carr University), where he was adored by his students. But when the Depression hit, he received the highest pay cut. He indignantly resigned and, with Jock Macdonald, opened the BC College of Arts, taking half the student body with him. Although the school was regarded as being at the forefront of progressive art and his creativity was prodigious, Varley was forever in debt. His family had been twice evicted; they had no furniture, no food. Varley, who had fallen in love with one of his students, left his wife and four children and moved to North Vancouver’s Lynn Valley. Then the school went out of business, it was time to get outa’ Dodge and he moved to Ottawa. When he died near Toronto in 1969, Varley left behind 500 oils, watercolours and sketches—a stunning body of work, and now a cherished part of Canada’s national heritage.